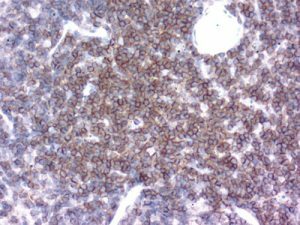 dianova’s antibody highlights concentrate on two groups of products: Antibodies for human pathology and antibodies for research purposes. The first group comprises outstanding antibodies for human pathology, that are suitable for standard formalin-fixed paraffin-embedded tissue sections and allow excellent staining results. In close collaboration with leading German pathological institutes dianova will gradually extend the panel of own IHC antibodies with new unique antibodies. Marker for astrocytomas and oligodendrogliomas. DIA-TG1 has been validated for the identification of TIGIT positive T-cells infiltrating human tumors. Clone TG1 is the first monoclonal antibody detecting TIGIT in routine formalin-fixed paraffin-embedded tissue specimen. Immunostaining of CALR mutated Megakaryocytes. CAL2 enables reliable distinction of CALR mutated ET and PMF from PV and reactive bone marrow alterations. Antibody clone SZ31 is the first antibody which reacts specifically with murine CD31 in standard formalin-fixed paraffin-embedded tissue sections. IHC-validated T (helper) cell marker for die mouse histology. Specific detection of CD4 in murine FFPE-tissue. For CD4/CD8 doublestaining with monoclonal anti-msCD8 from Rat. IHC-validated T cell marker for mouse histology. “Background-free” IHC staining of CD8a in murine FFPE tissue. For CD4/CD8 doublestaining with monoclonal anti-msCD4 from Rat. 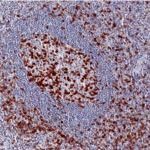 IHC-validated pan B cell marker for mouse histology. Specific detection of CD45R in murine FFPE tissue.